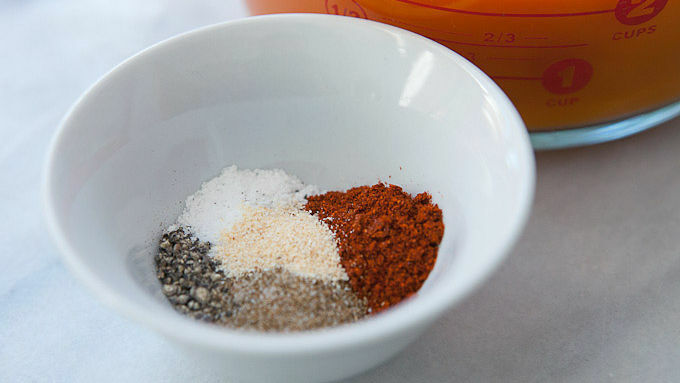 Whisk together the Spice Mix ingredients in a medium-sized bowl. Taste the mix and feel free to adjust it to your liking. 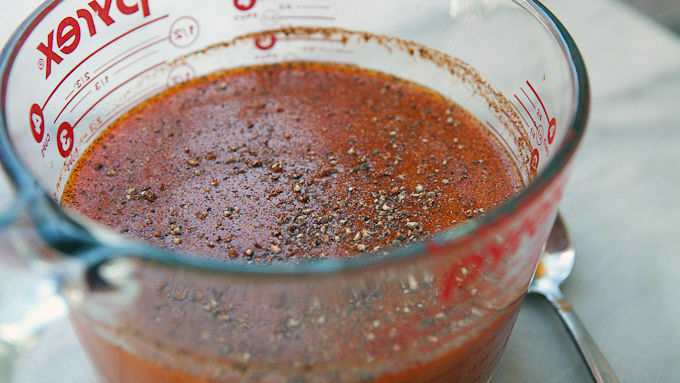 You can make it spicier by adding more hot sauce or just stronger in general if you like. You’ll use some in the Bunny Mary Mix, but you can also rim the glasses with the spice mix, so feel free to make a double batch! Combine Bunny Mary Mix ingredients. To make a single cocktail, rim a tall glass with a lemon wedge and sprinkle it with some of the spice mix. Then add in ice and 2 ounces of vodka. 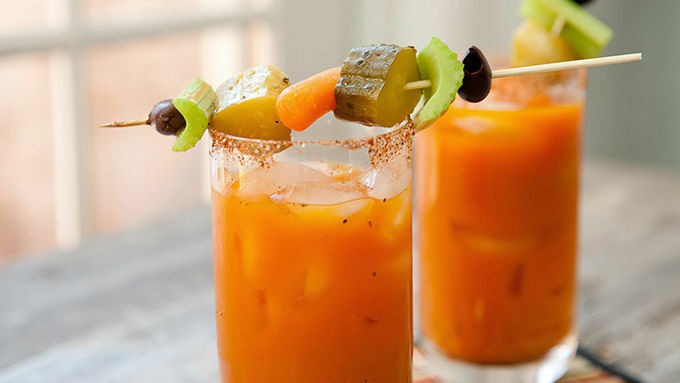 Fill glass with the Bunny Mary mix (about 4 ounces per drink). Garnish each drink with skewered olives, pickles, etc. I generally don’t like to mess with my boozy brunch drinks: It’s a Bloody Mary or it’s a mimosa. Let’s not make this more complicated than it needs to be, right? I tend to prefer the Bloody Mary, but there’s one thing that has bothered me about the drink: I don’t really love tomato juice. I love all the spices and add-ins in a Bloody Mary, but the tomato juice base isn’t my favorite. I’ve played with other juices over the years. I’ve tried beet juice with some success, but I think this is (finally) the answer to those that like the idea of a bloody Mary but don’t like tomato juice: carrot juice. Carrot juice, you see, is slightly sweet but still flavorful enough to hold up to the spices and add-ins that are a must for a good brunch drink. To start, I made up a little homemade spice mix with kosher salt, black pepper, chili powder, celery salt and garlic powder. I used this to not only season the Bunny Mary mix, but also to rim the glasses later. The mix is just 100% carrot juice plus some pickle juice and lemon juice (for acidity), Worcestershire sauce (for savory), and hot sauce (for spicy). Plus, add about two teaspoons of the spice mix. You can add more to taste, but that’s a good base amount. For me, any good Bloody Mary or bunny Mary will have loads of good toppings. For this version, it just made sense to use a little baby carrot plus some celery, pickle, and olives. I like to make little skewers of all the garnishes that can be dipped in the drinks. Then drink up! I love the color of this and it’s really tasty.